The FAX-515 is the ideal choice for home or on the desk at work. With a fax, phone and copier in one compact, attractive unit. It offers all the features of many more advanced machines but at a personal fax price. And with Brothers Anti-Curl System and Automatic Paper Cutter, you get plain paper-like performance. Next Fax Reservation allows you to insert and select the destination for your next transmission while a fax is being sent. It also offers the Telstra FaxStream Duet? * and Caller ID* compatibility. 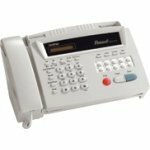 The Brother FAX515 Fax Machine was added to the Fax Machines category in June 2016. 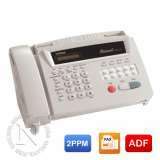 The lowest price GetPrice has found for the Brother FAX515 Fax Machine in Australia is $187.50 from PCDepot.com.au. Other merchants who stock it are PCDepot.com.au, GetBrother.com.au, Printer Supermarket, Cartridge Store, NES online.